Young rookie who displayed encouraging signs in his first season at The Hangar with a number of impressive games in the VFL. Selected for his prowess inside the contest, Mynott is a tough on-baller with good awareness and ball-winning ability, highlighted by some standout performances throughout the year. 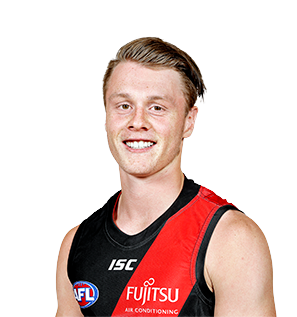 Mynott was listed as Essendon’s best against Geelong in round 19 with 25 disposals in tough conditions, while he gathered 32 disposals in an exciting effort against Richmond earlier in the year. Mynott also proved to be a handy acquisition in the forward line in 2018, booting seven goals, and he will continue to develop and push for his first senior game in 2019.